My son is really into music and I can usually hear it blasting from his room, but the other day I was screaming and screaming…I mean requesting that he make his presence known. I swung open his door and there he was, rocking out with his iPod, headphones in place. Oh, and I could hear the music from across the room. 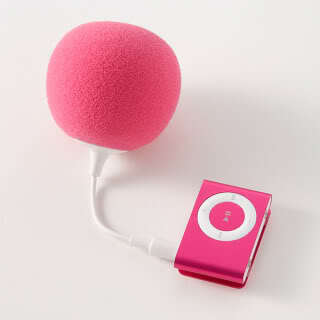 Nano to the pink balloon speaker. You can find Music Balloons audio speakers for $45 by flying over to poketo.com.